ONE OF BASEBALL'S MOST TALENTED PITCHERS. ONE OF PITCHING'S MOST DIFFICULT FEATS. 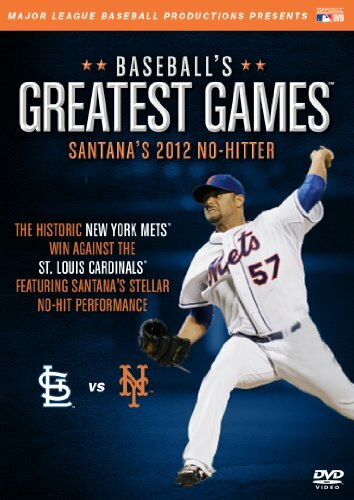 NEW YORK, NY - On June 1, 2012 at Flushing's Citi Field, ace Johan Santana threw the first no-hitter in franchise history when he blanked the St. Louis Cardinals and shocked Metsfans on a magical, unforgettable night. Featuring close calls, gutty pitches and terrific defense, this Friday night thriller takes a prominent place as one of the greatest moments in Mets history. And, on July 10, Major League Baseball Productions and A+E Networks Home Entertainment will anoint it as such when they release Baseball Greatest Games: Santanas 2012 No-hitter . A must-have for Mets fans everywhere, it will be available at Mets.com, and will be in stores, including the Mets Team Store, beginning July 10 for $12.95srp. Coming off a season lost to shoulder injury, Santana would throw the most breathless of games in the 8,020th regular season game in the history of the Mets. Ironically, the franchise known for its all-time roster of pitching greats had never recorded a no-hitter. One-hitters filled the Club's history books, and the 35 oh-so-close gems spun by familiar legends were wrapped up in one historic start from Santana. Back in 1962 at the Polo Grounds, Al Jackson tossed the Mets first one-hitter. In 1970 over a span of 28 days, Tom Seaver, Nolan Ryan and Gary Gentry each held the opposition to one hit. The list of one-hit wonders would go on: Dwight Gooden and David Cone, Terry Leach's 10-inning one-hitter and Steve Trachsel's two one-hitters in the same year. Fifty years of tantalizingly close performances - making Santana's achievement all the more gratifying. Re-live all the excitement of Santana's 8-strikeout tour de force with this classic game on DVD. Direct from the Major League Baseball archives, this extraordinary television broadcast includes the historic and masterful pitching performance of Santana, an unforgettable baseball game 50 years in the making. A special audio feature allows fans to watch the television broadcast and listen to the Mets Radio Network announcers in English or Spanish! Major League Baseball Productions is the Emmy award-winning television and video production division of Major League Baseball and the official video archivists of the game. With unparalleled access to the Clubs and their players, Major League Baseball Productions produces original programming for growing audiences worldwide through its network specials, exclusive home videos, commercials and other specialty programming. For more information on Major League Baseball Productions, log on to www.MLBProductions.com or follow @MLBProductions on Twitter and on Facebook at facebook.com/MLBProd.